World Cycling League | New Arena Concept: Velodromes! 23 Jun New Arena Concept: Velodromes! Historically, indoor velodromes have been built primarily to stage major international cycling events like the Olympics and Pan American Games. 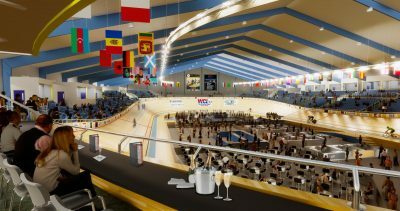 But there are many communities around the country where increased interest in cycling is stimulating a closer look at the value and economics of building indoor velodromes as year round focal points for cycling. Unfortunately, the stringent specifications required by the UCI (world governing body of cycling) for building velodromes to “Olympic standards” rarely address the importance of creating programming to sustain ongoing operations and regularly fill seats with spectators. 1. Smaller is better. Since we won’t be staging the Olympics or World Championships anytime soon, we elected to build a 200 meter velodrome instead of an “Olympic standard” 250. Smaller track means smaller building, less land, a more intimate spectator experience and about 30% reduction in overall cost. In fact, go figure, the UCI’s World HQ velodrome in Aigle, Switzerland is 200 meters, refuting its own standard. 2. Form follows function. The three most important considerations for a proper indoor velodrome are a clear span ceiling, tunnel access to the infield and seating site lines that take into account the steepness of the banking (generally around 45º in the turns). Everything else from locker rooms to concession stands and all other interior amenities can be more or less elaborate based upon budget. There are several attractive, practical building design options including pre-engineered steel buildings and air supported “bubbles”. Unless you have an Olympic budget, forget the architectural masterpiece. 3. Multi-use. The infield of a 200 meter velodrome is about 25,000 square feet. It’s the perfect size for all kinds of non-mainstream sports events, concerts and public gatherings. Arena football, box lacrosse, World Team Tennis and minor league basketball are just some of the sports that fit well. The velodrome’s natural bowl offers great atmosphere and temporary infield seating around a court or stage can boost capacity to near 4000. Drop down netting allows training on the track while ball sports are practiced simultaneously in the infield. Large arenas typically go dark when a big event isn’t happening. The beauty of our design is its usefulness for training during those many non-primetime hours in the week when there is no ticketed event. 4. Community endorsement. Not every city or town wants a velodrome. We have discovered that most interest comes from “B” markets and suburban towns where there is a need for a small multi-purpose arena that offers a local entertainment alternative to big league events and big league prices. We looked at three locations in the cycling friendly Philadelphia area and decided on Reading largely because the community is committed to new, innovative ideas. Ours fits: Greater Reading has a history of top level cycling events, mountain bike trails, great country roads, media support and a desire to create unique destination attractions. Add amazing vision and some unused property offered by Albright College and we have a perfect partnership that local politicians, businesses and the public happily supports. And with a projected Investor Rate of Return of over 20%, the $25 million price tag offers community stakeholders with a project that “does good and does well”. Plus Greater Reading, coupled with the highly successful Valley Preferred Cycling Center summer program in nearby Trexlertown, will have the unique and proud distinction of being the American epicenter for track cycling. 5. Anchor programming. Sorry to say that “If you build it, they will come” is a fantasy that does not apply, particularly when the goal is to attract investors, sponsors and paying fans, the lifeblood of any successful facility. This is where the World Cycling League comes in. We formed the WCL and created its TeamTrak® format, in part, to provide what track cycling lacks and what we believe today’s sports fan wants: 1) hometown teams to cheer for, 2) a consistent, fan friendly format that is exciting to watch and easy to understand, 3) a clearly defined season with team scoring that leads to playoffs and championships, 4) gender parity with an equal number of male and female riders per team, 5) state-of-the-art technology and livestreaming to boost fan engagement and 6) top quality international athletes who race hard and ride clean. The WCL’s twelve tournament season between October and March is the facility’s anchor. The forty-eight WCL athletes who reside during the season will coach development programs. Track training and club time will be scheduled for all ages and abilities. Albright’s soon to be formed cycling program will have a headquarters and the broader cycling community will be able to book the facility for special events and maybe even an occasional UCI event. The cash register rings even louder from additional revenue provided by non-cycling events, collegiate activities, a full service bar/restaurant and leased retail space for related businesses. And best of all, the National Velodrome at Albright College is a facility that can and should be duplicated in communities around the U.S. Take heed New Haven, Madison, Boulder, Cleveland, Minneapolis, Frisco and others. There is a viable and adaptable business model for an entertainment arena anchored by cycling.